The funeral home can assist each family in applying for Veteran's Benefits. Some benefits are available to all veterans who have been discharged or separated from active duty under honorable or general conditions; such as a burial flag, Presidential Memorial Certificates, and VA issued headstones or markers. Eligibility for certain other Veteran's benefits are based on each individual veteran's status. You may contact our funeral home and we will help you fill out any necessary paperwork and applications as well as making any necessary phone calls for you. With discharge papers, the VA provides an American flag to drape the casket of a veteran and to a person entitled to retired military pay. After the funeral service, the flag may be given to the next of kin or a close associate. The VA also will issue a flag on behalf of a service member who was missing in action and later presumed dead. 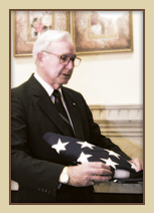 The funeral home will complete the flag application forms and procure the flag for you. We appreciate Owen’s Cleaners who have helped our local Veterans for years by offering complimentary pressing services for the flags presented to the families we serve. They have graciously served these Veteran’s for over 15 years. The Presidential Memorial Certificate is a parchment certificate with a calligraphic inscription expressing the nation's recognition of the veteran's service. The veteran's name is inscribed and the certificate bears the signature of the President. Certificates are issued in the name of honorably discharged, deceased veterans. Eligible recipients include next of kin and other relatives and friends. The award of a certificate to one eligible recipient does not preclude certificates to other eligible recipients. The veteran may have died at any time in the past. The local VA regional office generally originates the application for a Presidential Memorial Certificate. The next of kin also may request a certificate. Requests should be accompanied by a copy of a document such as discharge papers to establish honorable service. The funeral home will apply for a Presidental Memorial Certificate on behalf of the families of every veteran we serve. We can also apply for any veteran who may have died at any time in the past. Please contact us for assistance. Headstones and markers are inscribed with the name of the deceased, the years of birth and death, and branch of service. Optional items that also may be inscribed at the VA expense are: military grade, rank or rate; war service such as World War II; months and days of birth and death; an emblem reflecting one's beliefs; valor awards; and the Purple Heart. Additional items may be inscribed at private expense. When burial occurs in a cemetery other than a national cemetery or a state veteran cemetery, the headstone or marker must be applied for from the VA. We will assist the family in completing the necessary paperwork and sending the application to the VA. It is shipped at government expense to the consignee designated on the application. The VA, however, does not pay the cost of placing the headstone or marker on the grave. The funeral home will help you complete the VA form 40-1330. We will use the information on the DD-214 and other supporting documents to help you fill out the application as completely as possible. To memorialize an eligible veteran whose remains are not available for burial, the VA will provide a plot and headstone or marker in a national cemetery. The headstone or marker is the same as that used to identify a grave except that the mandatory phrase "In Memory of" precedes the authorized inscription. The headstone or marker is available to memorialize eligible veterans or deceased active-duty members whose remains were not recovered or identified, were buried at sea, donated to science, or cremated and scattered. The memorial marker may be provided for placement in a cemetery other than a national cemetery. In such a case, the VA supplies the marker and pays the cost of shipping, but does not pay for the plot or the placement of the marker. Only a relative recognized as the next of kin may apply for this benefit. Burial benefits in a VA national cemetery include the gravesite, opening and closing of the grave, a grave box and perpetual care. Many national cemeteries have columbaria for the inurnment of cremated remains or special gravesites for the burial of cremated remains. Headstones and markers and their placement are provided at the government's expense. Veterans and armed forces members who die on active duty are eligible for burial in one of the VA's 114 national cemeteries. An eligible veteran must have been discharged or separated from active duty under honorable or general conditions and have completed the required period of service. Persons entitled to retired pay as a result of 20 years credible service with a reserve component are eligible. A U.S. citizen who served in the armed forces of a government allied with the United States in a war also may be eligible. Spouses and dependent children of eligible veterans and of armed forces members also may be buried in a national cemetery, even if they predecease the veteran. A surviving spouse of an eligible veteran who married a nonveteran, and whose remarriage was teminated by death or divorce, is eligible for burial in a national cemetery. The VA will pay a burial allowance up to $2,000 if the veteran's death is service connected. The VA also will pay the cost of transporting the remains of a service-disabled veteran to the national cemetery nearest the home of a deceased that has available gravesites. In such cases, the person who bore the veteran's burial expenses may claim reimbursement from the VA. The VA will pay a $300 burial and funeral expense allowance for veterans who, at time of death, were entitled to receive pension or compensation or would have been entitled to compensation but for receipt of military retirement pay. Eligibility also is established when death occurs in a VA facility or a nursing home with which the VA contracted. Additional costs of transportation of the remains may be reimbursed. There is no time limit for filing reimbursement claims of service-connected deaths. In other deaths, claims must be filed within two years after permanent burial or cremation. The VA will pay a $300 plot allowance when the veteran is not buried in a cemetery that is under U.S. Government jurisdiction if the veteran is discharged from active duty because of disability incurred or aggravated in line of duty, if the veteran was in receipt of compensation or pension or would have been in receipt of compensation but for receipt of military retired pay, or if the veteran died while hospitalized by the VA. The plot allowance is not payable solely on wartime service. WHO IS ELIGIBLE FOR REIMBURSEMENT OF BURIAL EXPENSES?